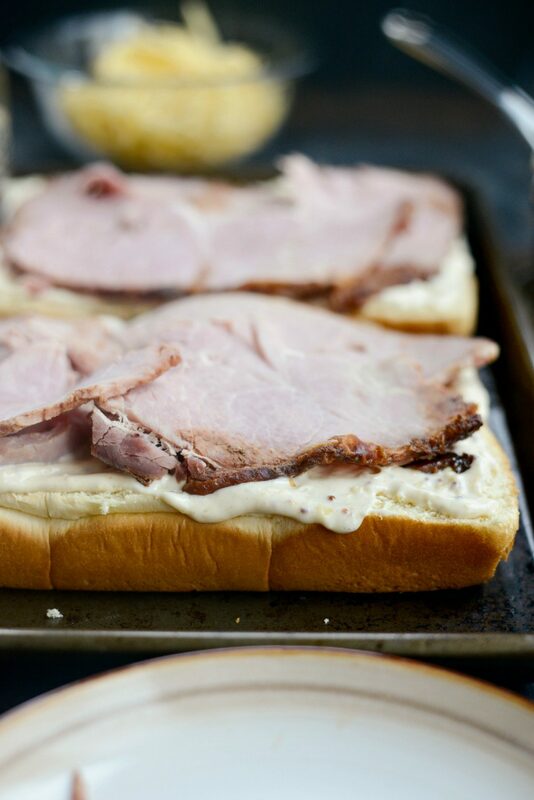 These Ham and Gouda Party Sandwiches are a great way to use up your leftover ham! 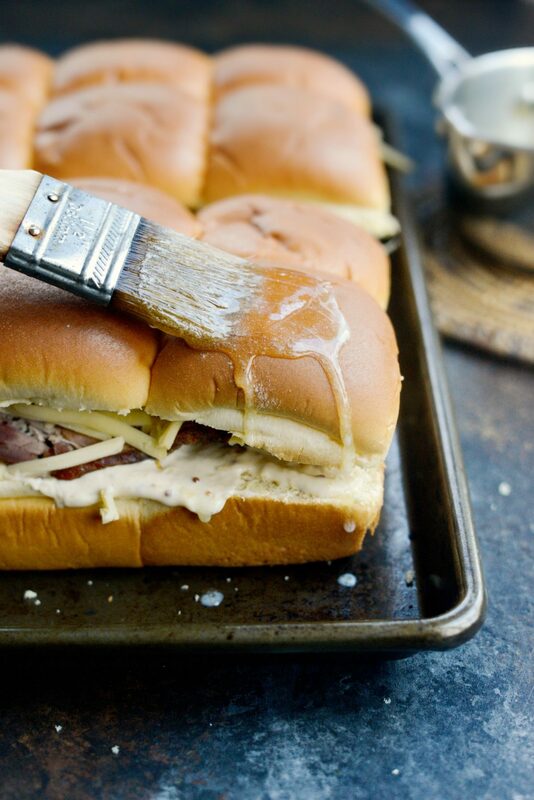 Turn dinner rolls into buns and slather them with a homemade roasted garlic dijon mayo and stack with leftover ham and shredded gouda cheese. Brush with butter, sprinkle with everything seasoning and bake until golden and toasted and deliciously melty. 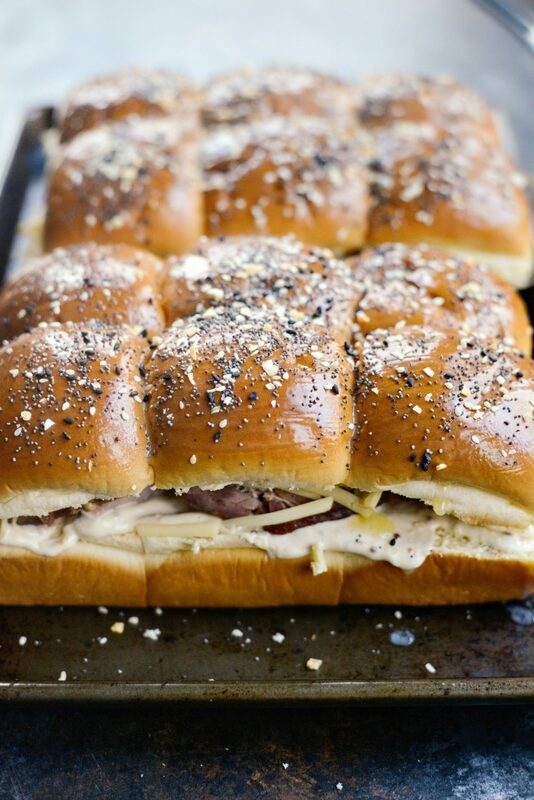 These sandwiches are great for feeding a crowd. How was your holiday?! Our was wonderful! Pat is on call for his job this week, and he ended getting a call that had pulled him away from home missing all of Christmas Eve. However, he was luckily not called in on Christmas Day so we spent the entire day together. That honestly was the biggest gift of all. It was relaxing and cozy, we got plenty of snow so it was most definitely a white Christmas. I don’t know about you, but I always buy way-to-big of ham for the holidays. Last year, I bought a huge ham for my mom’s side Christmas celebration. I bought a variety of cheeses, breads and condiments for my family members to make sandwiches. Because sometimes even I want something a little more substantial than a meal of appetizers. Afterwards, I had basically a whole ham left. It didn’t look like we even made a dent in it. The next day I rummaged through my fridge and found a wedge of gouda and formed a plan. Now, I didn’t make the rolls because I had them already, but hey that would just make an easy recipe not-so-easy if you had to make your own rolls, right? 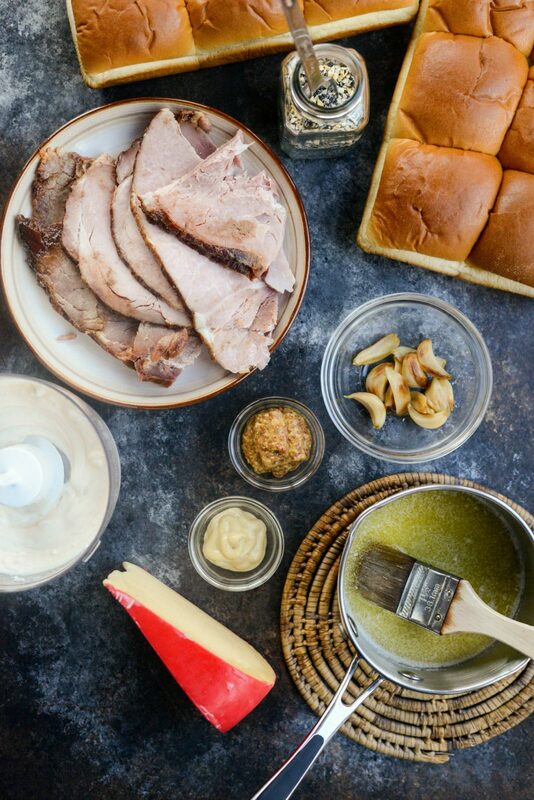 Here’s what you’ll need: a large package (of 12 rolls), 8 to 10 slices of leftover ham (deli ham will also work), 2/3 cup mayonnaise, a head of roasted garlic, 1 tablespoon whole grain mustard, 2 teaspoons Dijon mustard, an 8 ounce wedge of Gouda, melted butter and everything seasoning. To roast the garlic: break up a small head of garlic into individual cloves [with the outer skin intact] and place them on to a sheet of aluminum foil. 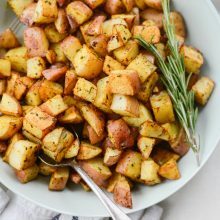 Drizzle with a little olive oil, then fold up the sides of the foil like a purse, and place onto to the middle rack of your preheated 400° oven and roast for 20-25 minutes. Remove and let cool until safe enough to peel off the outer skin of each clove. 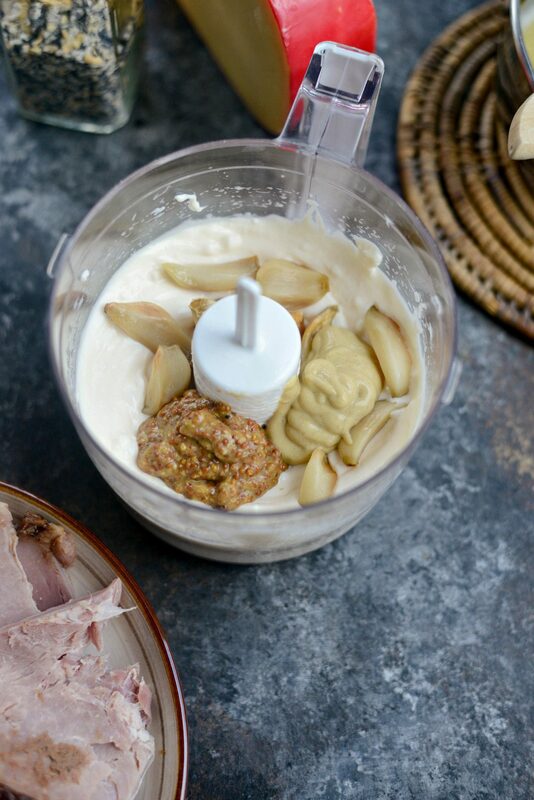 To the 2/3 cup of mayo add in all of the roasted garlic cloves, a tablespoon of whole grain mustard and 2 teaspoons of Dijon mustard. 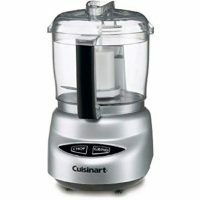 Blend until combined, scraping down the sides and continuing to blend until somewhat smooth. Slice the rolls in half, keeping the base and top in one large piece. Then generously spread the mayo onto the base of the rolls. 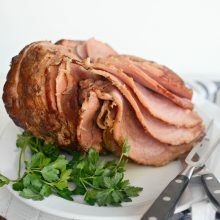 Top with slices of the leftover ham. Generously layer with the shredded gouda. Carefully replace the top of the rolls and brush the top with the melted [salted] butter. Sprinkle with 1-1/2 tablespoon of everything seasoning or you could simply use sesame or poppy seeds. 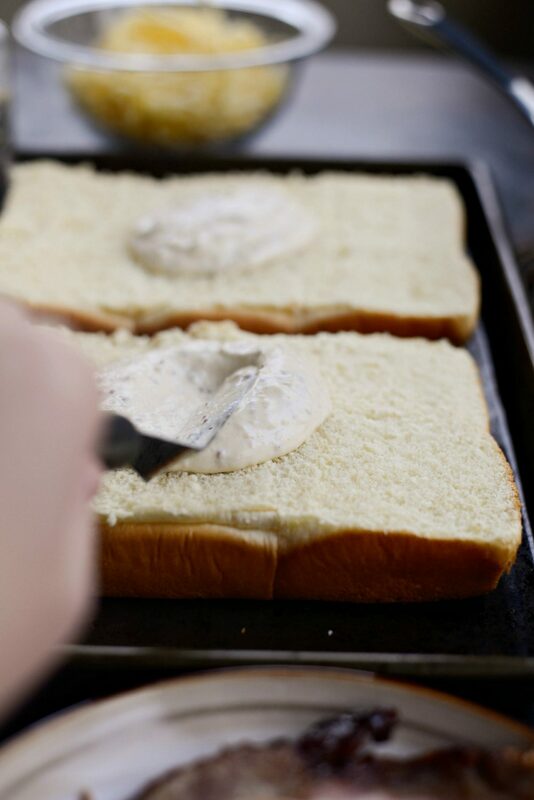 Slide the sandwiches into a preheated 350° oven for 15 to 20 minutes or until heated through and the cheese is melted and the tops are golden brown. 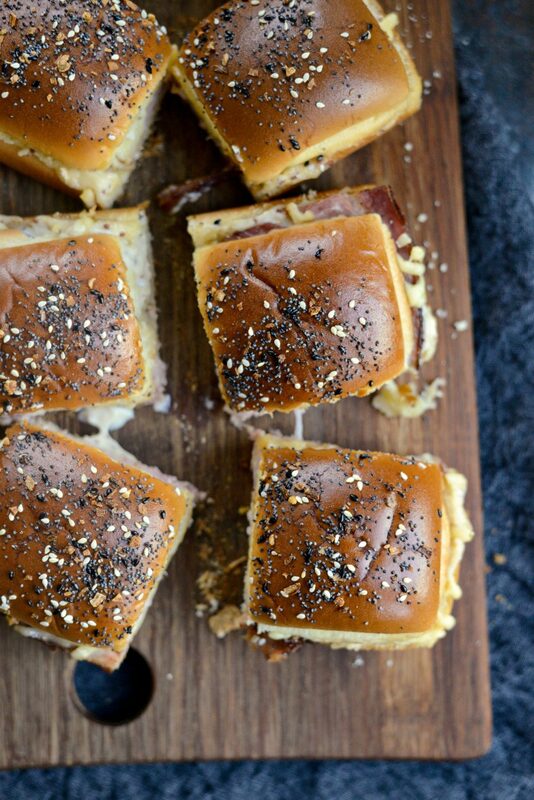 Cut the ham and gouda party sandwiches and serve immediately. 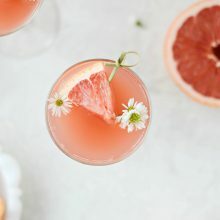 Great for serving a crowd at a gathering or party. 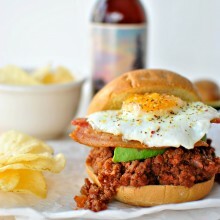 These are so delicious and simple to throw together. Enjoy! 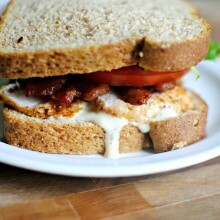 And if you give these Ham and Gouda Party Sandwiches a try, let me know! Snap a photo and tag me on twitter or instagram! 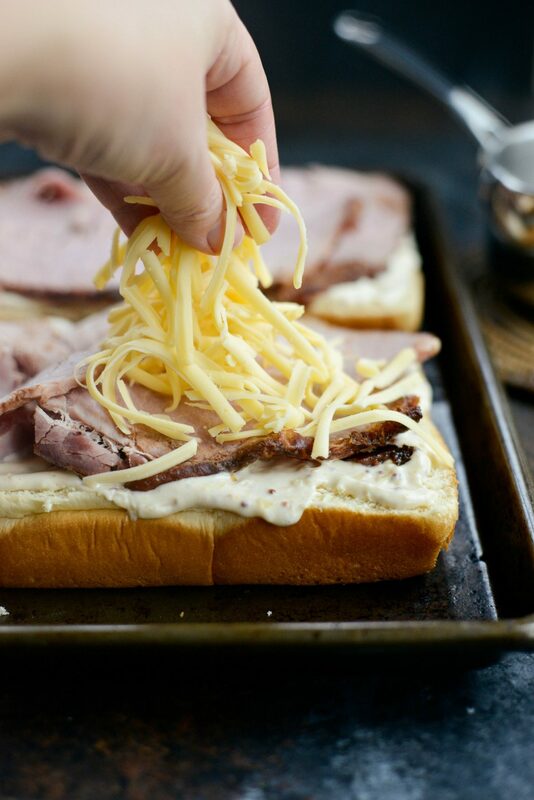 These warm Ham and Gouda Party Sandwiches are a great way to use up leftover ham. 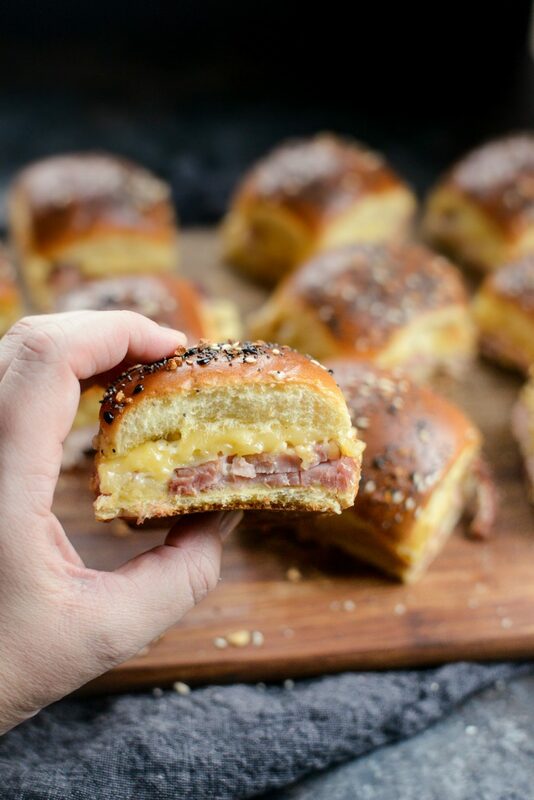 Turn dinner rolls into buns and slather them with a roasted garlic dijon mayo and stack with leftover ham and shredded gouda cheese. Brush with butter, sprinkle with everything seasoning and bake until toasted and melty. 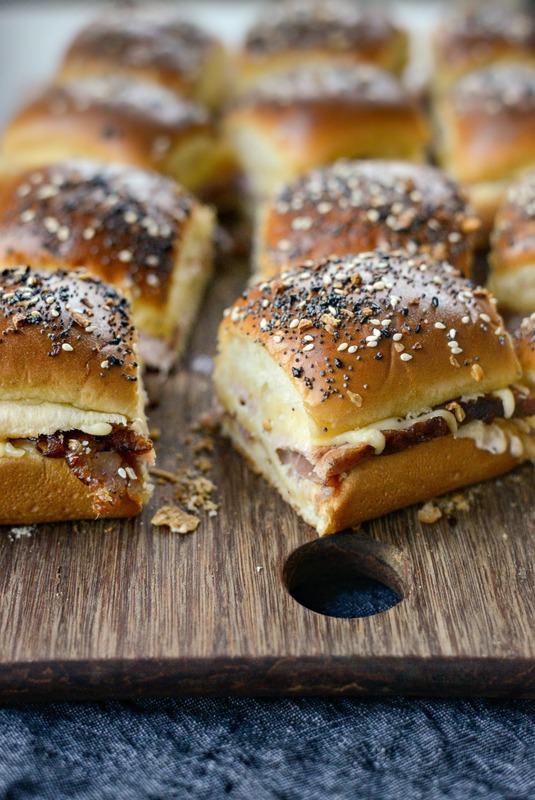 These are great for feeding a crowd. FOR THE ROASTED GARLIC: Break up a small head of garlic into individual cloves [with the outer skin intact] and place them on to a sheet of aluminum foil. Drizzle with a little olive oil, then fold up the sides of the foil like a purse, and place onto to the middle rack of your preheated 400° oven and roast for 20-25 minutes. Remove and let cool until safe enough to peel off the outer skin of each clove. 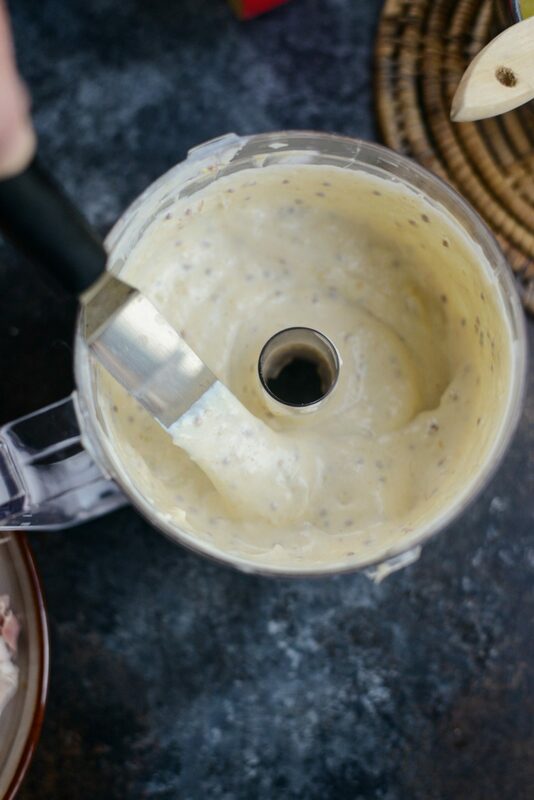 FOR THE SANDWICHES: In your mini food processor, combine the mayonnaise, roasted garlic, and both mustards until smooth. Scrape down the sides and blending until the ingredients are incorporated. Slice the dinner rolls in half horizontally keeping the base and tops intact in one large piece. 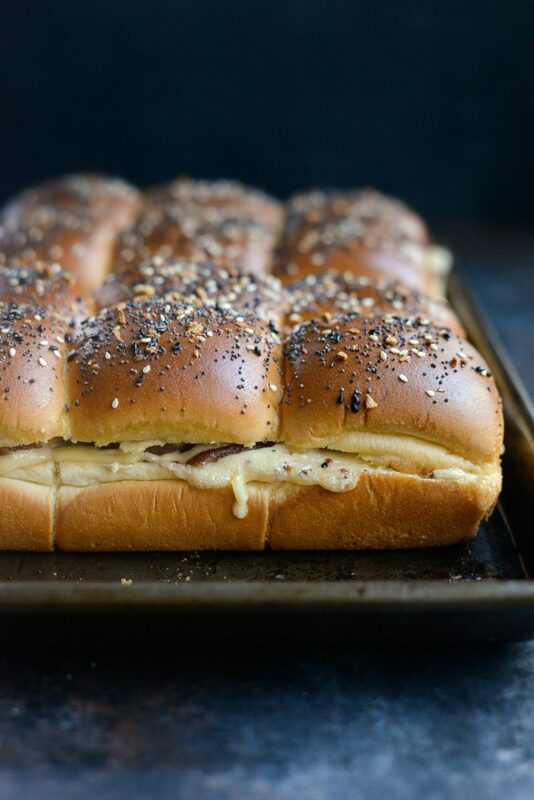 Place the bottom half of the rolls onto a rimmed metal sheet pan and generously spread the roasted garlic dijon mayo on top. Then layer with ham and shredded gouda. Replace the top of the rolls, brush the tops with melted butter and sprinkle with everything seasoning. 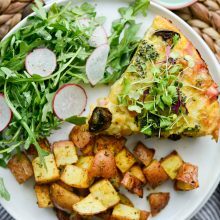 Bake on the middle rack of your preheated oven for 15 to 20 minutes, rotating the pan halfway through for even browning, until the sandwiches are heated through and the cheese is melted. The tops should be golden brown and toasted. 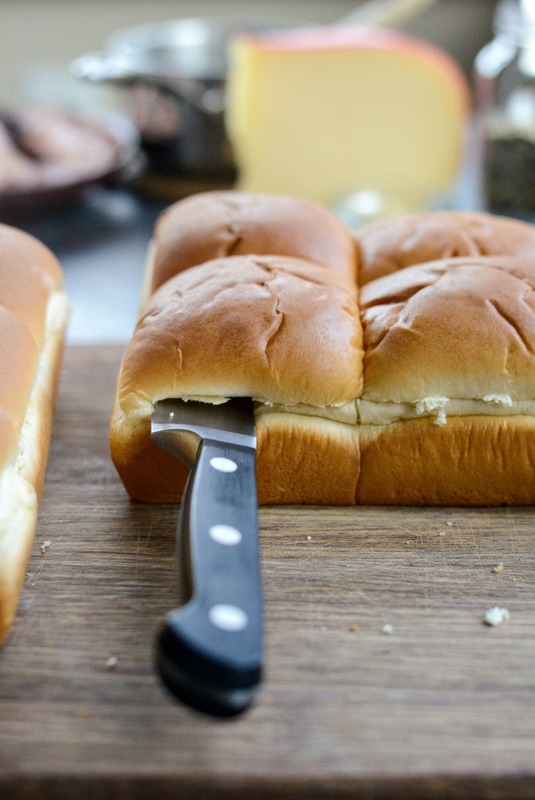 Cut the rolls into sandwiches and serve immediately. 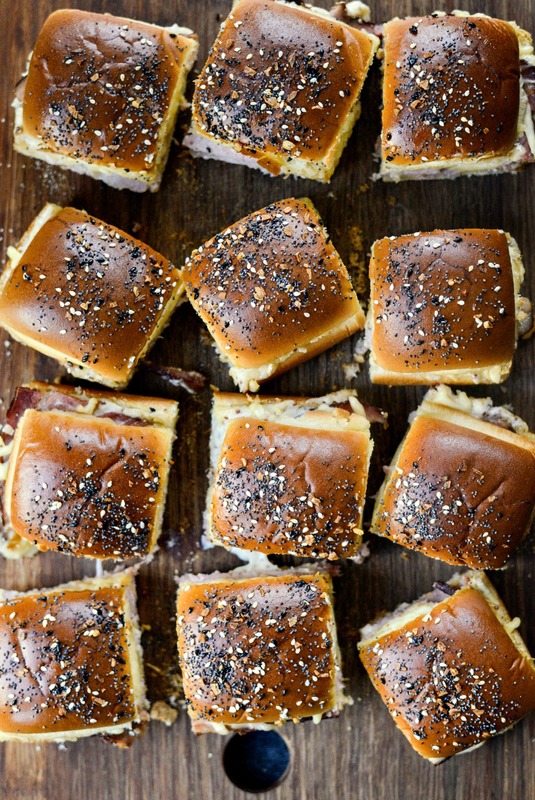 We called these ‘funeral sandwiches’ in the south, haha! 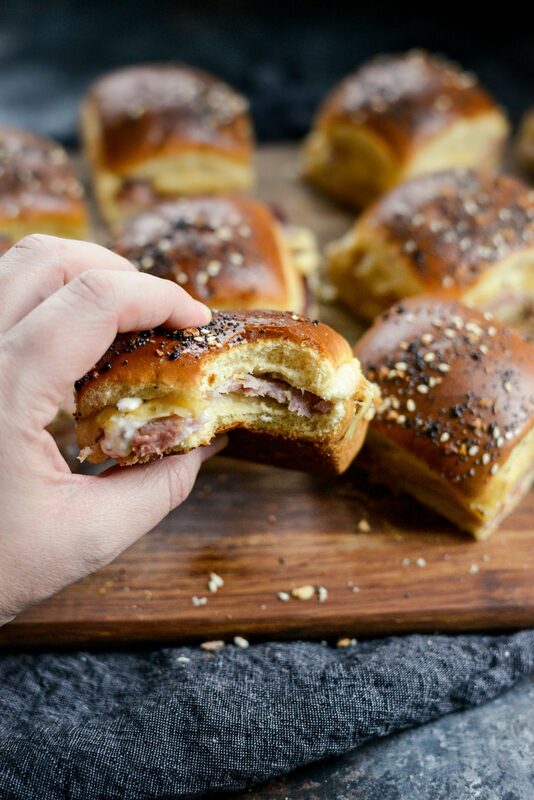 They were usually just ham and cheese, but if you were feeling fancy you would use provolone! 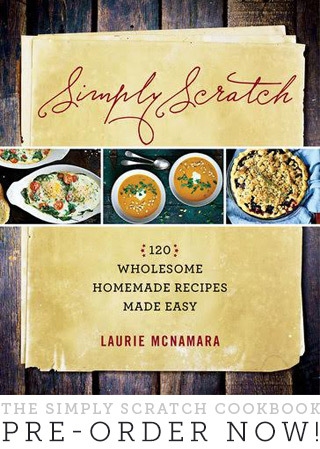 This recipe takes me way back. I had no idea these sandwiches had a name! Ha! Too funny!